About the BookA provocative and heart-wrenching novel about family, loss, and loyalty from acclaimed and bestselling author Chris Crutcher. Losers Bracket is the powerful and gripping new novel by the author of Staying Fat for Sarah Byrnes and Whale Talk. Award-winning author Chris Crutcher’s books are strikingly authentic and unflinchingly honest. 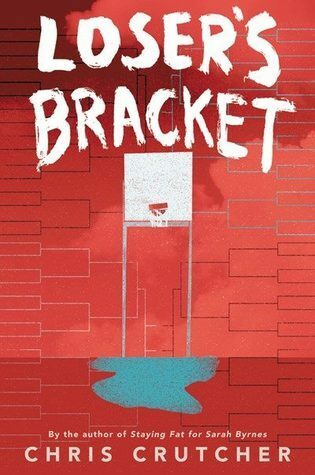 Losers Bracketis by turns gripping, heartbreaking, hopeful, and devastating, and hits the sweet spot for fans of Andrew Smith, Marieke Nijkamp, and Matt de la Peña. Read more at HarperCollins. I can't thank you enough for the wonderful day we had with you at Avon High. Your down to earth presence, your captivating stories and your gentle spirit were enjoyed by all. The students in Mrs. Henderson's class told me today that reading "King of the Mild Frontier" and meeting you was so much fun and "enriched their lives very much". They came to the library this morning....​​ just to chat about what a special day it was. I even heard that some students who are usually not quite so engaged went home telling their parents the same stories you told them that day. How cool is that!! I love it when one of those not so easy to engage minds is touched in some way!!! You did that!!! Ever since I heard you speak to a group of librarians about 5 years ago I have admired you. It was also a great pleasure for me to meet you and to be able to spend the day with you. Since I will be retiring in June, I can't think of a more enjoyable way to spend my last "author visit". I am enclosing a photo of the students in Mrs. Henderson's class with all the fun momentos they made for you. 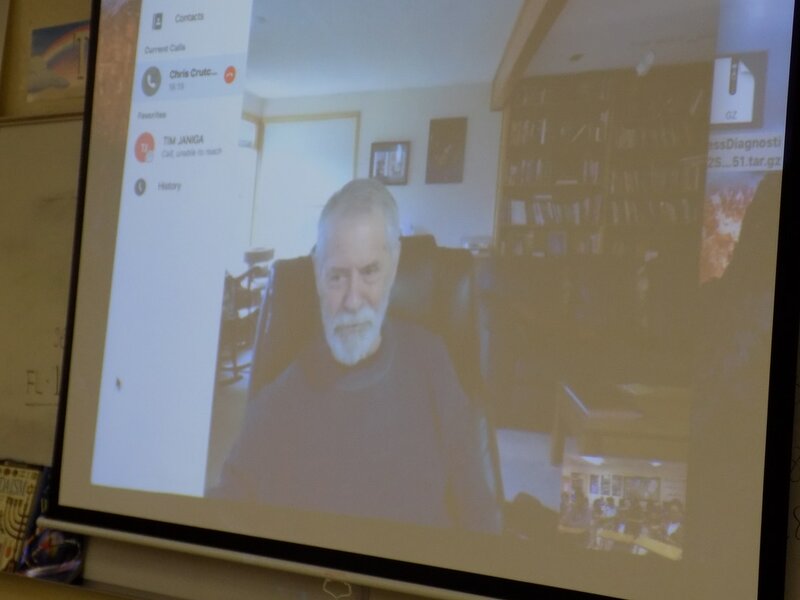 On April 26, 2017 Chris Crutcher Skyped with students at the Riviera Beach Preparatory and Achievement Academy in Riviera Beach, Florida. WHALE TALK had been required reading and he shared the origins of the book, and the kids shared their projects and reader feedback. Master teacher Toshimi Abe-Janiga was kind enough to share a few photos. Thank you! So as you can see, I made it to the Mississippi Delta and was received with far more deference than I had coming, but hey, when you have the wool, pull it over their eyes. I said it would be an adventure and it was all of that. The students who got the ball rolling to get me there in the first place had read my stories, acted out key scenes, trading and sharing roles, and in that process bringing their perspectives and personal interpretations to the lives of my characters, and I swear they knew more about Deadline and Period 8 than I do. One young woman performed an eye-roll so perfect she was staring into her own brain when she had to remind me the name of a character I had created. Time in Emily’s classroom includes a celebration of imagination coupled with focus on mastery and analysis of language and stories. Every student’s input is treated with regard and the visiting author gets free reign. There is humor, respect and rigor...and APPRECIATION, all the way around. A day in the life of an author doesn’t get better than this. LOOKING FOR A NEW ANTHOLOGY? "​Powerful, riveting, and real. Sixteen celebrated authors bring us raw, insightful stories that explore guns and teens in a fiction collection that is thought provoking and emotionally gripping. For fans of Forgive Me, Leonard Peacock and Give a Boy a Gun, and with an array of YA talent like the late great Walter Dean Myers, the poetic Joyce Carol Oates, the prophetic Elizabeth Wein, and the gritty Chris Crutcher, these are evocative voices that each has a different perspective to give. Capturing the hurt and the healing, victims and perpetrators, these stories get to the heart of the matter." "DeKALB – Thirteen-year-old Brayten Wilkerson's interpretation of a 34-year-old novel was powerful enough to bring the author to Clinton Rosette Middle School for a series of assemblies on the issue of race." Read the full May 2016 article text HERE. Good news! You now have not one but two opportunities to join Chris Crutcher, Kylene Beers, Bob Probst, Penny Kittle and other excellent educators at the Boothsbay Literacy Retreat -- one option in Maine and the second in San Diego. For more information, click HERE. The National Coalition Against Censorship announced Anne Wade of Cullowhee as the winner of the 11th annual Youth Free Expression Project Film Contest, which asked teen filmmakers to explore censorship issues of the past, present and future. Chris Crutcher was one of several judges for the selection process. Read more about it HERE. Love WHALE TALK, the BOOK? Think MOVIE now, too! Help bring WHALE TALK to a silver screen near you! ...to best selling author Chris Crutcher's website. For the past 30 years, Crutcher has written cutting edge, realistic fiction for readers who have experienced the angst and formative challenge of being a young adult. Known for a powerful mix of humor and tragedy, Crutcher's books explore coming of age, through stories and language authentic to that experience. You'll find all the latest news about CC and his work here. If you'd like to write to CC directly, he prefers email and will respond if you contact him at Stotan717@gmail.com. If you'd like to book CC as a speaker, contact him directly, or contact his assistant, Kelly at KellyMilnerH@aol.com. She coordinates his bookings. Have a picture of Chris you'd like to see on his website? Suggestions or complaints? Send those to Kelly, too and she'll do her best to help.